Pix.ie is one of those services that works in every way. With a clean, fast and easy to operate interface, combined with an excellent backend system, Pix.ie proves that not only are there alternatives to Flickr, ImageShack and Photobucket, but they're Irish! To cement their position as the best photo hosting service around, Pix.ie recently set itself the daunting task of achieving the fastest upload of any amount of photos to a single website. The event was developed in conjunction with the WDC-sponsored (Western Development Commission) competition being run on the site. 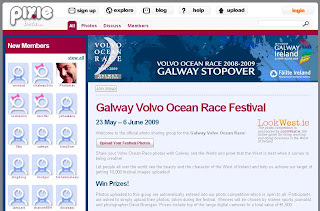 The competition called for users to upload photos taken during the Galway Volvo Ocean Race Festival. Although the competition doesn't close until this Thursday, 11th June, Pix.ie have already smashed the record for uploads with 10,140 photos from the Volvo Ocean Race Festival already uploaded to the site. The overall photo competition offers users the chance to win a host of prizes, including top-of-the-range digital camera equipment worth €1,500. Pix.ie has run the record attempt in conjunction with the WDC to promote the West of Ireland internationally.